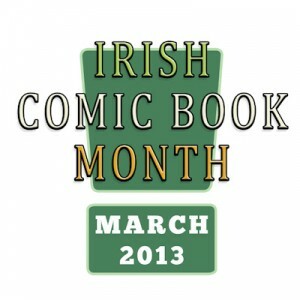 What better day could there be to report on Irish Comic Book Month in the Emerald Isles? However, as in most of the publishing industry, women comics creators must battle for recognition there. When Lightning Strike comics hosted a panel at Dublin’s Trinity College about the Irish comics scene this past week, all six guests were men — Declan Shalvey, Stephen Mooney, Robert Curley, Darrin O’Toole, Robert Carey, and Ciarán Marcantonio. I’m delighted that there is interest and support for the burgeoning comic book community in Ireland. I’m disheartened and disappointed that last night’s event did not include any women. As an Irish woman who writes comics and reads them, this hits me hard. It offers no representation for women producing work in the field. I would not expect this invisibling of women in my country in 2013. Any number of women could have appeared – she lists four outstanding examples, Maeve Clancey, Leeann Hamiliton, Anthea West and Naomi Bolger. And she reminds everyone that since March 2011 she has maintained a web page listing women working in comics in the UK and Ireland. This entry was posted in Like Show Business and tagged comics by Mike Glyer. Bookmark the permalink.